Our “Best Of” series continues with Maker’s Mark bourbon. Their tagline of “It Is What It Isn’t” caught our attention recently. Follow them on Facebook and Twitter. If you pay attention to this type of thing, you’ll know that bourbon has absolutely exploded in popularity in the last couple of years. How popular is the quintessential American spirit? According to NBC News, bourbon constitutes 70% of the $1.1 billion worth of spirits exported from the United States every year. It has gone from a decidedly “uncool” drink to hipsters in New York not wanting to drink anything other than 20 year old Pappy Van Winkle (which is where our admiration of hipster culture begins and ends. #getoffmylawn). 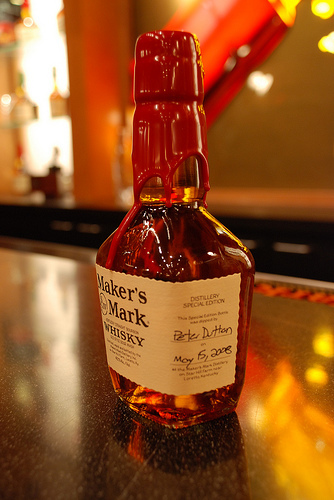 One of the most iconic of bourbon brands is Maker’s Mark. With its signature red wax seal (a brilliant branding move in itself), a bottle of Maker’s is impossible to miss in the liquor section. In 2011, Maker’s Mark launched a new campaign with the tagline “It Is What It Isn’t”. If you know anything about these #FF posts, you know that we love branding that makes you pay attention and engage with it. This tagline is one that grabs you immediately and demands your attention. Most brands go about defining themselves with what they are, touting their own virtues and strengths that make them the best at whatever their particular widget industry. Some are confused by this tagline, but we think that’s exactly the point. Maker’s Mark wants you to learn more about their bourbon. Why they spell it “whisky” as opposed to “whiskey” for example. Grabbing you with a tagline that allows room for interpretation is a little risky. A tagline is often the front porch for a brand as it is the first thing you think of in relation to that brand. Putting it on the consumer to define what that tagline means to them is both very brave and very clever. You’re inviting the consumer to paint your front porch. As Maker’s Mark is one of the top five selling brands of bourbon, they’re clearly doing something right.